Certain fish are not good for pregnancy, so it is important to find out what fish are okay. Toss some salmon into the shopping cart the next time you’re stocking up and cut your risks for heart disease in half. Diets high in omega-3 fatty acids, found in cold water fishes and other plant sources, are known to cut heart disease risks. The latest research reported in Hypertension, the American Heart Association journal, looked at women ages 15-49 and found that those who ate at least 2 fish meals a week had the greatest protection against heart disease. Women who rarely or never ate fish had risks up by as much as 90%. 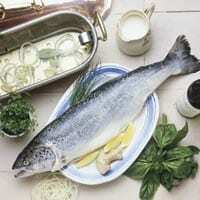 The most common fish consumed by women in the study were cod, salmon, herring, and mackerel. For guidelines on safe consumption of seafood in pregnancy, read our article Fish Please!